Founded in 1966, the Long Island Maritime Museum is located on fourteen beautiful waterfront acres. The grounds were formally part of the Meadowedge estate. The estate was the home of Mr. & Mrs. Anson Wales Hard. Mrs. Florence Hard was the daughter of Commodore Frederick G. Bourne, President of Singer Sewing Machine from 1889 to 1905. The Museum's Main Building, once the former estate garage, now houses the Museum's offices, galleries and library. 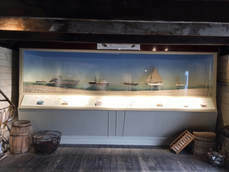 The Museum's newest interactive exhibit, located in the North Gallery, enables visitors to learn about Long Island's maritime past. By using this interactive display visitors can access historic information about lighthouses, more than two hundred and fifty ship wrecks and the many heroic acts of the U.S. Life-Saving Service. Visitors can also challenge their gaming skills by firing a cannon or navigating a sail boat through dangerous water. Adorned with racing cups and trophies, our library includes over 3000 maritime related books and archival research materials. The library is open for onsite research. To access this collection please contact a Museum staff member and request an appointment. This 1890 cottage, relocated in 1983 from 45 West Avenue, was built for Mr. & Mrs. Leonard Beebe, and eventually their seven children. The cottage remained in the Beebe family until it was donated to the Museum and has been restored with their help, based on family history, photographs and documents. Visitors can experience the way a typical bayman's family lived in the nineteenth century. This structure was once the laundry building for the Brooklyn Hotel located in Center Moriches. When the hotel burned down Mr. Penney jumped at the chance to rescue the building for use in his boatyard. In 1978 it was floated by barge from Moriches to the Museum. 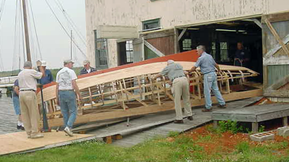 Today it serves the same purpose it served in 1900 - it is the center of our volunteer boat building program. This National Historic Landmark is typical of the oyster culling houses that once dominated the south shore. Built in 1908, Rudolph used this building to process and distribute oysters. Originally located on Shore Road in West Sayville it was relocated to the Museum grounds in 1975. Visitors will enjoy seeing the many artifacts and photographs documenting historic oyster cultivation and processing in the West Sayville. Our 1888 Oyster Sloop was designated a National Landmark in 2005. During the summer season, docked in Oakdale at the Snapper Inn, she is available for public sails and charters on the Great South Bay. To reserve a sail on the historic sloop please visit Sailpriscilla.org or contact the Museum. Throughout the year the Main Gallery hosts temporary exhibits highlighting fascinating maritime themes. These can range from maritime arts to historic events and unusual artifacts. These exhibits are often introduced to the community through celebratory openings. Information about these exhibits are obtained by subscribing to the Museum's mailing list. ​Gil Smith are on display.